Any well-seasoned expatriate employee in Thailand has come to terms that the truth, in theory and per proper compliance with the laws & relevant regulations involved in obtaining a Thai Work Permit is not as easy as it appears, and is on the contrary – a rather arduous ordeal. Inasmuch, the Thai Work Permit has become commercialized with business-minded entrepreneurs actually exploiting the fact of the process’ and requirements’ inherent cumbersome-ness. The flowchart above provides a very brief overview of the immigrational process for legally continuing being present in Thailand vide Work Permits and Non-Immigrant Business Visas toward a possible ultimate ends of acquiring Thai Citizenship. 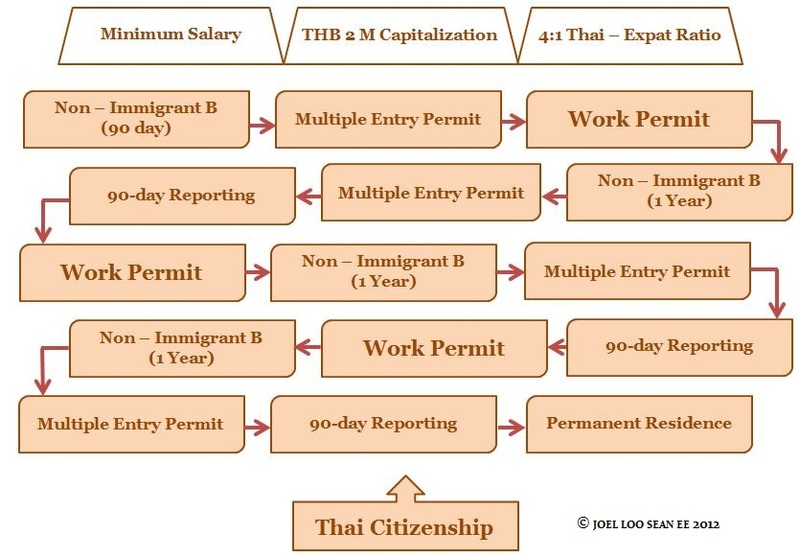 It is fundamental to note that there are generally 3 major requirements for – in the employer’s perspective – a company to be able to legally employ a foreign employee, obtain the necessary work permit and obtain the proper visa endorsement, reiterated below in brief, along with the respective ‘ways around’ that is manifest in Thailand. Generally, although the view of practitioners are divided as to whether this registered capital has to have been paid up or not – in practice, the Labor Ministry is usually satisfied with this amount as registered capital regardless of whether it has been paid up. 1. “Parking” the expatriate employee’s work permit in another company. 2. In practice, the proof of the employment of such parallel 4 Thai employees are evidenced by producing submitted social security contributions and income tax. Generally, there are companies which have ‘ghost employees’ which lend their names to these registers and where the provider makes such requisite contributions at such minimal rates. 3. A combination of the above two also may be convenient for expatriates that do not qualify for retirement or marriage visas, do not own their own company, but wish to remain here for other reasons. There are various minimums that are determined according to nationalities of prospective expatriate employees that are changed from time to time. As such stipulated minimums in accordance with the Thai Immigration’s regulations may be rather high and does not reach a compromise between a needy employer or a conceding employee, these minimum rates may not be practical. This is often dealt with ‘declaring’ a salary higher than that actually received by the employee – and corresponding contributions in social security and tax are remitted. All things considered thus, the question of whether indeed a work permit is the ultimatum is unavoidable. Obviously, the performance of any work by exertion of “physical strength or knowledge whether or not intended for wages or any other benefits” [Working of Alien Act B.E. 2551 (A.D 2008) (“WOAA ’08“)]. This does not take into account any professional fees that may be involved. Maximum Term of Imprisonment of 5 years. Fine from ฿ 2,000 to ฿ 100,000. If the employee is agreeable to leave within 30 days, he/she may be relieved of any prison sentence. Where the expatriate employee holds a work permit, but is in contravention of other provisions of the WOAA ’08, he/she is liable to a maximum fine of ฿ 10,000. Rather recently, the employer has been relieved of criminal liability in the employment of expatriate employees in contravention of the WOAA ’08. Fine from ฿ 10,000 to ฿ 100,000 per offending expatriate employee. Similarly, where an employer employs an expatriate employee with a work permit, but such employment is in contravention of other provisions of the WOAA ’08, it is liable to a maximum fine of ฿ 10,000. While the chances of the authorities knocking on the doors of employers are somewhat minimal – it stands true that Thailand’s laws are clearly spelt out and are to be stringently adhered to. There should be no cutting corners and these laws should be duly complied with; failure to do so would constitute an open invitation by both employer and employee to face severe consequences. It is crucial for investors and proprietors worldwide with an eye on Thailand to thoroughly consider the tax implications that flow from their inception within Thailand’s tax regime. Similar yet distinct from other tax jurisdictions, it is important to understand the different forms of taxation, methods of tax calculation and common structures to deal with the local tax. Equipped with in-depth tax knowledge, the investor or proprietor may indeed find that Thailand’s tax implications are not severe in comparison. With proper implementation of strategy and structure, Thailand’s tax is far from an incapacitating burden but on the other hand rather accomodating for international subsistence. In fact, for instance, where a foreign entity’s Thai presence qualifies, it may be privilleged as a Regional Operating Headquarters (“ROH”) which grants the foreign-owned ROH minimal tax liabilities. Thailand’s tax code is encompassed in the Thai Revenue Code (“TRC”) and Ministerial Regulations. It flows that the Thai-sourced income of Foreign Companies carrying on business in Thailand [Taxable ‘Permanent Establishments’ include “Companies incorporated in a foreign country and carrying on business in Thailand” – Section 66 Paragraph 2 Thai Revenue Code] is taxable. This provision essentially catches all foreign companies with Thai ‘agents’ generally taking the form of affliate / subsidiary companies that derive income within Thailand as ‘carrying on its business in Thailand’ – ‘agents’ of which are obligated to file returns and remit taxes on income and/or gains so earned by the foreign company. This principle is further encompassed in the respective Double Taxation Agreements to which Thailand is a member to, i.e. explicitly catching ‘agents’ as ’employees’ and may usually be found under Article 5 which generally provides for the definition of ‘Permanent Establishment’ (e.g. Article 5(3)of the Thailand – Hong Kong Double Taxation Agreement). Representative / Regional Offices do not attract tax liability as they function as non-revenue generating vehicles. It is also important to observe that Thailand’s Corporate Income Tax Regime makes no distinction between foreign-owned and Thai-owned companies. There are also various industry-specific based rates, for instance, in the Oil & Gas industry – 50%. The branch office is required to deduct 10% PRT upon distribution of profits to the head office within 7 days in the following month of which distribution was made. Late payment attracts a penalty of a 1.5% surchage (capped at amount of tax payable). In short, the 10% PRT is only to be imposed after the 30% Corporate Income Tax has been remitted. Where the foreign company may be considered not to be carrying on business in Thailand, any offshore remittance of profits will similarly attract a 10% Withholding Tax as per Section 70 TRC. For companies incorporated in Bangkok, the appropriate form of adjudication of tax disputes is the Central Tax Court. Taxpayers desirous of contesting tax assessments to the Thai tax Courts are required to pay their tax so assessed up front, somewhat in a manner of an ante. Inasmuch, legal challenges to tax should not be thought of as leeway for suspending tax payment. Practice-wise, evidence such as mortgage deeds, bank guarantees, and so forth may be submitted to the Tax Revenue Department to show that the tax has been paid. Upon receipt of the final Court decision favoring the taxpayer, the taxpayer will be awarded a refund of his surplus tax payment on top of which there will be imposition of 1% interest per month (which need be requested) amount of which is capped at the amount of tax and is not compoundable. How to Terminate an Employee? Must be in compliance with Employment Agreement, Work Rules, and applicable Law. Employees may resign at any time, subject to such Resignation Notice Period as may be contained in the Employment Agreement. Generally, the resignation of the employee is tantamount to a waiver of any severance pay that may be due and where the employee’s desire not to pursue its ‘retirement notice’ of which said desire is accepted by the employer (i.e. not to require the employee to serve working the notice period), the employee is not entitled thus to any payment of wages in lieu of notice of his/her own resignation. Employment Agreements generally contain Notice clauses which be must adhered to by both employee and employer, i.e. the employee is generally required to tender an advanced notice of resignation and vice versa. Minimum of 1 (one) full payment cycle’s notice (normally 1 month) in advance with a maximum of 3 (three) full payment cycle’s notice. Nonetheless, at such point, employee – employer relationships may have already turned sour and it may not be feasible to require the employee to continue working till expiration of the notice period. Generally, where the employee wishes to resign immediately, the employer may accept such immediate resignation and the employee thus will not be entitled to any payment of wages in lieu of notice per the employment agreement. This however is not normally the case in respect of Termination by the employer, where the employee may desire to continue working through the termination notice period. Thenceforth, to effect immediate termination, the employer is mandated to pay the said payment of wages in lieu. The effective date of resignation / termination will be at the end of the payment cycle and before the commencement of the next. If Company O issues a Termination Notice to B in the middle of B’s payment cycle (generally meaning mid-month), and B’s employment agreement states that there is a Notice Period of 3 months – the said 3 months will begin to run after the end of the current payment cycle (generally meaning beginning next month). If Company O wishes to effect the termination immediately, payment of wages of the current month + 3 months payment of wages in lieu of notice needs to be given to B. Where better terms are contained in the employment agreement or work rules & regulations – such better terms will be given effect by the law. There is no statutory maximum age of employment in the private sector. Retirement age instead is usually determined by the employer’s policy but notwithstanding such stipulated retirement age, termination by reason of an employee’s age is considered termination without cause and such notice prescriptions and severance payments are accordingly applicable. Available, subject to the rule that parties cannot contract out of Thai Employment Laws’ stipulated minimums such as the minimum notice period, the provided severance requirements, and so forth. So long as the individual Directors / other Senior Officers are employees, the LPA requirements apply mutatis mutandis, along with such specific requirements applicable to removal – appointment of Directors contained in the CCC, the employer company’s Articles of Association and other relevant laws. Automatic Termination where it is impossible for employment agreement to be performed. Circumstances are such as inter alia, destruction of employer entity or employee’s death. Thai law is silent on this and principles of freedom to contract are applicable. These are enforceable subject to reasonableness and adherence to the Thai Unfair Contract Terms Act, Labor Protection Act, public order and good morals. More detailed illustrations on acceptable Non-Competition Clauses is provided here in BANGKOK LEGAL BLOG (BLB) Write-Up on Franchising. In essence, in construing reasonableness / fairness, a degree of specificity must be infused upon the period and area of restriction, the subsequent employability of the employee in his profession / industry and the parties’ respective lawful interests. Employees may challenge Terms contained in Employment Agreements contending that they are unfair, and it is the general inclination of the Courts that these Terms will be interpreted as tending toward the employee as opposed to the employer. It is the general consensus that the Thai position with regards to Employment, in the interpretation and provision of the LPA, interpretation of the terms of the employment agreement, work rules & regulations, etc. lean toward the Employee and much care is taken to determine what is fair and reasonable given the circumstances and that Employees are not oppressed by the generally stronger position Employer. Leap-Frog Appeals for Labor Courts – go directly to Supreme Court. Where there is no corresponding Labor Court as according to territory, a Labor Claim may be brought in a Court of First Instance.